Vatican Releases New Document on Salvation — Good Read! The Congregation for the Doctrine of the Faith has released a new document–which it does not do too often. It was written by the head of the congregation Archbishops Luis Ladaria at the request of Pope Francis. It addresses two problematic tendencies in the modern world that relate to the heresies of Gnosticism and Pelagianism. “1) Why was the document released? On March 1, the prefect and secretary of the CDF—Archbishops Luis Ladaria and Giacomo Morandi—held a press conference in which they announced the new document. The document can be read online here. 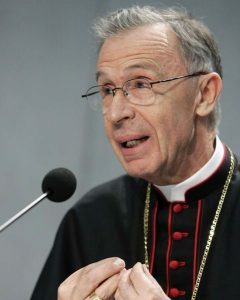 Archbishop Ladaria explained that the document arose after some theologians asked the Congregation to further examine themes discussed in its earlier document on salvation, Dominus Iesus (2000). This document proved controversial because it explained the Church’s faith in Jesus Christ as the unique Savior of mankind, which some took as a slight to non-Christian religions. The new document—Placuit Deo (Latin, “It has pleased God”)—reaffirms Christian teaching on Jesus as “the only Savior of the whole human person and of all humanity” (n. 2), but it does not dwell on the issue. Instead, it focuses on two problematic tendencies in modern society that Pope Francis has called attention to, comparing them to the ancient heresies of Pelagianism and Gnosticism. Pelagianism was a heresy which minimized or denied the need for God’s grace in avoiding sin and achieving salvation. It is named after Pelagius, a monk from the British Isles who lived in the 300s and 400s. Pelagianism was fought by St. Augustine and others, and it was condemned at a variety of councils. According to the Pelagian heresy, developed during the fifth century around Pelagius, the man, in order to fulfil the commandments of God and to be saved, needs grace only as an external help to his freedom (like light, for example, [or] power), not like a radical healing and regeneration of the freedom, without prior merit, until he can do good and reach the eternal life (fn. 9). Gnosticism was a heresy that arose in the second and third century. It took many different forms. Gnostics claimed to have special knowledge about the nature of the world and an alleged hierarchy of divine, celestial beings. They commonly saw the material world as evil, being produced by an inferior divine power who was identified with the God of the Old Testament. Have They Discovered a New “Lost Gospel” that Says Jesus was Married?